2018.08.29Technology exchange meeting organized by the Industrial Technology Institute of Miyagi Prefecture Government was held at ALPS ELECTRIC CO., LTD. We introduced our service at this opportunity. 2018.07.18List of Lectures and Explanatory Meetings in the Past is Updated. 2018.07.01Tohoku University New Industry Creation Hatchery Center, NICHe and SND concluded the contact of collaborative research. Hybrid nano particles that we design can be produced by using facilities of Tohoku University, which allows us to accelerate our R&D. 2018.05.19List of Lectures and Explanatory Meetings in the Past is Updated. 2018.02.14-16We are exhibiting at nano tech 2019 - The 18th International Nanotechnology Exhibition & Conference. 2018.02.11Our website has been opened. 2018.02.07Our research has been adopted by the Ogasawara Foundation for the Promotion of Science & Engineering. 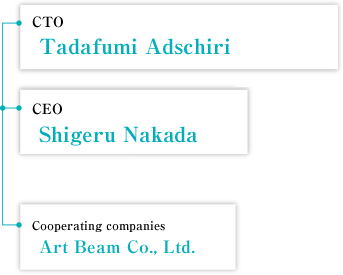 2018.01.11Super Nano Design Co.,Ltd has been founded. Super Nano Design Co., Ltd. was established in 2018 based on supercritical hydrothermal synthesis technology developed at Tohoku University, Japan. We offer recipe development, basic design for equipment, and production and sales of custom-made nanomaterials that meet the needs of various industries. With our method, nanoparticles of nearly all oxides, complex oxides, and sulfides existing in the natural world can be mass-produced in uniform size using inexpensive metal salts. Furthermore, based on the supercritical technology, we have succeeded in organic modification that is both extremely unique and the foremost technology of its kind in the world. Development of various nanomaterials by supercritical methods has been conducted through national projects and industry-academia-government collaborative research. Through this development we have accumulated information on the selection of optimal synthesis conditions, optimal equipment design, and dispersion/fluidity control of the synthetic materials. As a result, we made it possible to synthesize particles from several nanometers to several microns in size, make organic surface modification, and create high-concentration dispersion in solvents and polymers. We have been meeting requests for new materials from various industries. We are committed to playing an essential role in society by providing various solutions for manufacturing fields. 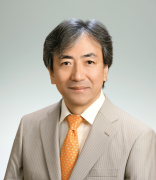 Tafafumi Adschiri is a Professor of the Advanced Institute for Materials Research(AIMR), the Institute of Multidisciplinary Research for Advanced Materials (IMRAM) and New Industry Creation Hatchery Center（NICHe） at Tohoku University. He graduated from the graduate school of engineering of the University of Tokyo as a Doctor of Engineering. After keeping his research at the University of Tokyo as assistant professor, he became an associate professor of Tohoku University. In 2002, he started at IMRAM as a professor and at AIMR in 2007. His specialty is supercritical water reaction and he is the inventor of supercritical hydrothermal synthesis method. Awarded from the Minister of Education, Culture, Sports, Science and Technology, the Society of Chemical Engineers, the Japan Chemical Society, and more. Supercritical water refers to the state when water is under high pressure at high temperature. When the pressure is 22MPa or more and the temperature reaches 374℃ or more, water becomes a high-density vapor state which is neither gas or liquid. This state of water is called supercritical water. Super Nano Design Co., Ltd. develops new nanomaterials using supercritical water. Nano materials design:What organic molecules should we modified on the nanoparticles? 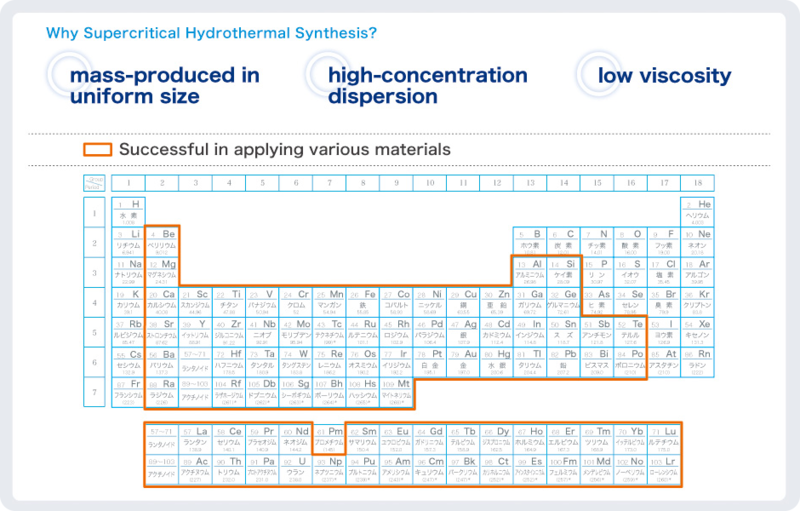 Recipe:Finding optimal conditions for synthesis takes too much time. Process design:Optimum design for equipment varies depending on the material. From “Sendai” Station, take the Subway bound to”Yagiyama Zoological Park”. Get off at “Aobayama” station. About 15 minutes from Sendai station taxi pool. You may take a taxi to NICHe from Sendai Station. *No guest parking is available. Public transportation is recommended where possible.